And I never thought in a million gazillion years I would be saying that. A proper post on what the heck is making us buck the system and home school while IN America coming soon and don't worry I was as shocked as you might be. And yes, we are on African time in starting school but so is all of Chicago due to the teacher's strike so no worries right? We started today (nothing like lots of time to plan and read through everything) and it was rough. We all cried; Anni (at least 3 times), Evy (lost count) , and me (once when I finally got a shower and sobbed). I need a lot of prayer to embark on this new path in our journey. 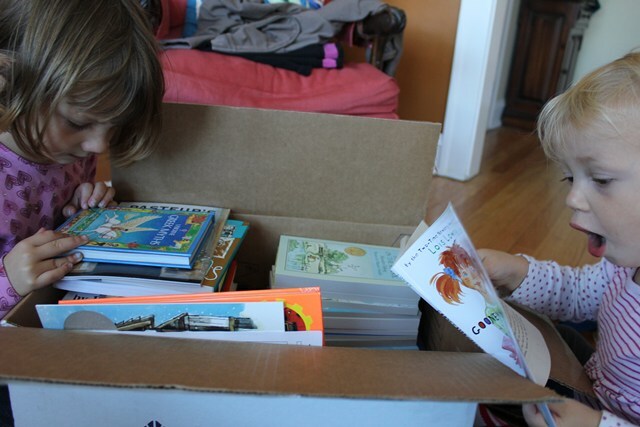 And yeah I love this photograph (minus the ever present pile of unfolded clothes that are taking over my house) because I could not even pay Evy for the cheesy pose...she is that excited for new books. I gotta admit I took a sniff too. Praying for you! By God's grace, girlfriend!! Love you. And Evy's face is priceless. I am guessing it's going to bless you more than you could imagine...cuz steppin' out in obedience tends to do that. So for that I am as excited for you as your girls are for new books- hee hee. AND praying because I have heard the first year is tough. you know if you ever need hep with the school type stuff i am more than willing!! Praying for you! What curriculum did you end up picking? Evy is really to cute! You captured the right moment :-)We wish you a good start and lots of patience and grace. Is there the option to get a place in a playgroup for Evy at least for 3 days a week or something like that??? I guess this would help a lot!